* Coreloft™ 140 (140 g/m²) insulation. Made with highly crimped multi-denier siliconized polyester yarn, this lightweight, breathable, and thermally efficient, 100% polyester staple fibre is very compressible and has excellent loft retention. * Machine wash in warm water (30°C). * Tumble dry on medium heat. Kappa Hoody - Mens is rated 4.7 out of 5 by 17. Rated 5 out of 5 by TheCommuter from Excellent I am just a regular guy that commutes for school and walks around town. I am not a mountain climber or anything. I wore this jacket and was waiting outside for the bus at -19C. It kept me just warm enough and I was only wearing a single layer of t-shirt on the inside. I like the tall collar that keeps wind out of the neck part and the overall weight of this jacket. Also, the warmth is quite impressive compared to the weight of the jacket. The material and the stitching are also extremely good; good enough to be noticeable. Definitely a good buy if you are looking to commute as it is warm enough for windy and cold conditions while preventing your body from overheating in the hot subway. Rated 4 out of 5 by NorthernExposer from Very good jacket, but pricey I'm 6'2" and 180lbs, and the fit of this jacket is good (size L). Stiching, zippers, pockets, etc, are all very well built When I wear the hood down, the front collar tends to lean in against my mouth, so that's a little annoying, but not a big deal (I either zip it down 3 inches, or, I wear a scarf to prevent this from happening). Reason I got this: it's very comfortable, and relatively light compared to thick down alternatives. I can wear it at at -15 Celcius with a sweater underneath. Disadvantages: price. I think this jacket at maybe 60-70$ less would be appropriate. Overall: I'm happy with it and wear it a lot. Rated 4 out of 5 by Rman from Good Jacket OK, I'm just a big dumb guy looking for a warm winter jacket. I live in New England where the winters are really cold. I'll probably walk the dog in it, ski, go out and get the mail, whatever. I just want to be warm and not look like the Michelin man. So I don't want or need some Euro slender thing with skinny arms, differential insulation, a thousand zippers, stratospheric high tech shell material, that still doesn't keep me warm for hundreds of dollars(!). Or some monster jacket. I went on a multi-year quest for a decent jacket, checked every outdoor and ski shop in my area, ordered (and sent back) nearly a dozen jackets and finally found thee jacket, I hope, in a reasonable price range. The Kappa is light weight and warm so far (still early winter). It fits well and looks good. I believe she's a go. Rated 5 out of 5 by Wasatcher from My General Use Parka Didn't intend to buy this, ordered an Atom SV and Backcountry sent this by mistake. They said I could keep it or exchange so I kept it. Well, really glad I did. Pros: Extremely warm for it's weight, great at keeping the wind out, room underneath for thick layers, very lightweight for a parka, very comfortable to wear, great hand pockets. Cons: Not as bulletproof as most Arcteryx outer pieces, not really trim fitting This is the jacket I grab when I'm heading out the door for errands, shoveling snow when it's cold, or skiing if it's extremely cold, say sub zero. I did tear it by snagging it on a rack in a Home Depot. It was an easy repair and I shouldn't have worn it scrounging around a hardware store. If you want rugged, there are other pieces. But if you want light weight, highly functional, reasonably durable and extremely warm, this is a great piece. Rated 5 out of 5 by Danny from If you were going to own 1 jacket... ...this would be it. Ya, I know what you're thinking: "I have an Atom LT Hoody. Now how do I 1-up my Arc'Teryx game?" You've found it. I love this jacket. Its windproof, Its taped Windstopper, so its basically waterproof (although Arc'teryx wont say that), and super warm. When its cold out and I'm cold, I put it on then I'm warm. I wear it almost as much as my Atom LT and its awesome. Rated 5 out of 5 by Johnny2times from Possibly the Best Arcteryx Jacket Out There I have had this jacket for just over 6 weeks. It is easily my favourite Arcteryx purchase to date. The construction is impeccable and has quality materials. What is truly surprising is how warm this thing is. Winnipeg gets very cold and it has yet to fail. It is remarkably lightweight, yet very warm. The Windstopper fabric truly works. The best part is that it insulates you like a champ, yet doesn't have that 'puffy jacket' look. Lots of room underneath for a layering piece as well. I'm 5'9", 180lbs and the medium is perfect. Rated 5 out of 5 by hksp1 from Most underrated insulated jacket from Arcteryx To start I am 174cm, medium built with a 92cm chest measurement, 33"waist and 65kg so i got myself a Small on the Kappa Hoody. I have owned most Arcteryx jackets you can name including the Fission SV, mid layers and other hardshells so i am able to test any combinations out. The fit. The fit is their Athletic fit, which is generous. It is NOT the fit that you find on your Atom LT, but it is rather identical to the Atom SV, but slighty longer overall. Meanwhile it does not make you look like a tyre man either. The Small fits me perfectly with enough room for layering. I can definitely wear my baselayers on, even the Atom LT without affecting movements. It does not feel restricted. And thanks to the hem adjustments you can still custom tune it even if you are only wearing a t shirt on. One little complain is the chin guard being too stiff, which might irritate you. Zippers and pockets. It has a 2 way main zipper and it is beefier than that on the Atom. It also has a button snap closure at the bottom of the zip. The only downside is the main zipper will unzip itself in windy conditions or you are moving around with you helmet on just like the one on the Atom. This might be something you will need to consider. Warmth. 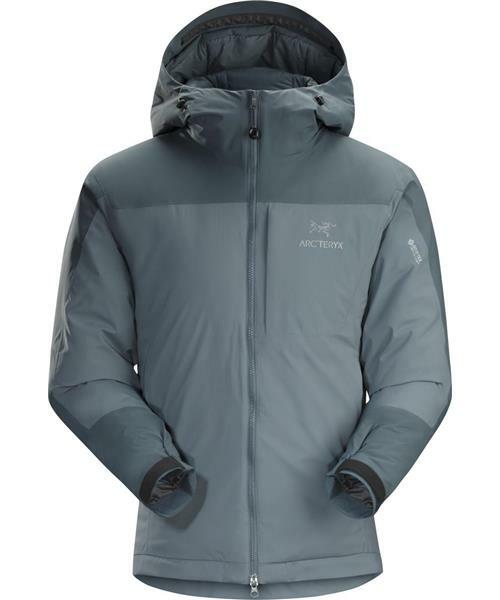 In my opinion this is the warmest jacket from Arcteryx, period. I have the Atoms, the Thorium and Cerium down jackets and none of them get close to the Kappa, even combining with my hardshells. Yes the Fission series might be reviewed as warmer by most people but i disagree with that. This thing has my vote for sure. I can understand the Atoms are made for mid layers but it is definitely possible to wear the Kappa under a hardshell in extremely cold conditions without any restrictions. Windproofness/Waterproofness. I have worn it with a t shirt in a 6 degree celcius, with a Northernly Wind + 30mm rainfall environment for 4 hours. The Windstopper fabric is not waterproof but it beads off rain really well. I wasnt soaked until the 2nd hour but thanks to the CORELOFT, the Kappa still kept me dry. For a stormy day or downpour, wear your Gore Tex hardshell with some insulation. As we all know Windstopper is not built for waterproofing. However for windproofness this thing does its job perfectly. Hood. Adjustments. Insulated Storm hood has perfect coverge, no problems here. 2 drawcords at the back of hood ensuring perfect fitment, just like the ones on the hardshells but the 2 drawcords on the front are inside the jacket, which might be a drawback if you need to adjust the hood with gloves on. They do not bother me but you might need to take this into consideration. Hem adjustment drawcords is single-handed design just like other Arcteryx jackets. Pockets. 2 hand warmer pockets on the sides with do not get in the way of your backpack. 1 chest pocket that is large enough for my phone (Samsung S4) with a couple of mesh pockets inside which is very handy for goggles and sunglasses. Overall i am very satisfied with the Kappa Hoody. For the price you just need to have one. Sure it might not be as waterproof as the GORETEX Fission series or as versatile as the Atom series but it is definitely warmer. It has a generous but not baggy cut but if you want to look cool and slim i suggest you get something else. In my opinion te downside of this jacket is the chin guard being too stiff, or maybe the 2 hood adjustments being built inside the jacket. Apart from that i use it everyday around town, ski and mountaineering with it, in dry - low moisture conditions. You are not going to insist wearing it in a rainstorm because it is not built for it. Thanks ARCTERYX for this beautiful jacket. Rated 5 out of 5 by Steve from Kappa Hoody - great jacket I've had this jacket for over a year & this is the 2nd winter using it. It gets cold here & we had -45 c with the wind chill recently. I really like this jacket & it's my go to jacket for cold. It has a great fit & adjustment. I use the Fission SV (which is the same but goretex) when it's belting it down with snow, but prefer the fit & comfort of the kappa. I have no suggestions for improvement & highly recommend it.